Remember those big fat well-stuffed parathas by Aaoji Khaoji at Bopodi and JM Road? Well, they are coming up with their third outlet in Pune and we have got the deets. The third outlet of Aaoji Khaoji will be opened right at the heart of the city – Camp! The menu will be unchanged. So hog on to those Tiranga biryani paratha for INR 400 and the oh-so-delicious Yuvraj Singh Paratha with chole, sabzi, salad, rajma and more, for INR 550. 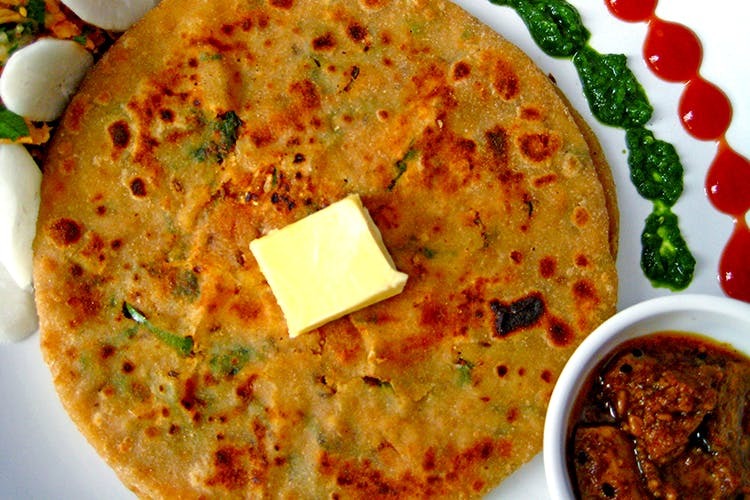 We highly recommend you try the Sunny Deol Paratha Thali for INR 400. This meal will include a special sabzi, dal makhani, thick buttery paratha, rajma, salad, papad and aachar. If you’re a group of hungry souls, try the Yo Yo Honey Singh paratha thali with paneer pakoda, chole rajma, cream fruit, jumbo papad and more. Priced at INR 900, this one is a must-try! The third outlet will be opened near Rosemary School, next to BMW showroom in Camp. Make sure you go there for the best parathas in town!